Mexico is bordered on the north by the United States; on the south and west by the Pacific Ocean; on the southeast by Guatemala, Belize, and the Caribbean Sea; and on the east by the Gulf of Mexico. Covering almost 760,000 square miles, Mexico is the fifth largest country in the Americas. With an estimated population of over 113 million, it is the world’s eleventh most populous country and the most populous Spanish-speaking country. Easily accessible from the US, many traveling Americans are drawn to Mexico because of the shorter travel times. The nation’s temperate climate and unique culture make Mexico an attractive destination for any visitor. During your surface interval travelers can find jungles and impressive Mayan archaeological sites and the Caribbean coast. Most divers going to the Pacific Coast will find themselves enjoying the comfort of liveaboard diving. Scuba diving in Mexico can either mean coral reefs in warm Caribbean waters or big animals in the cooler Pacific Ocean. These two regions are as different as diving in the waters of Florida and California. 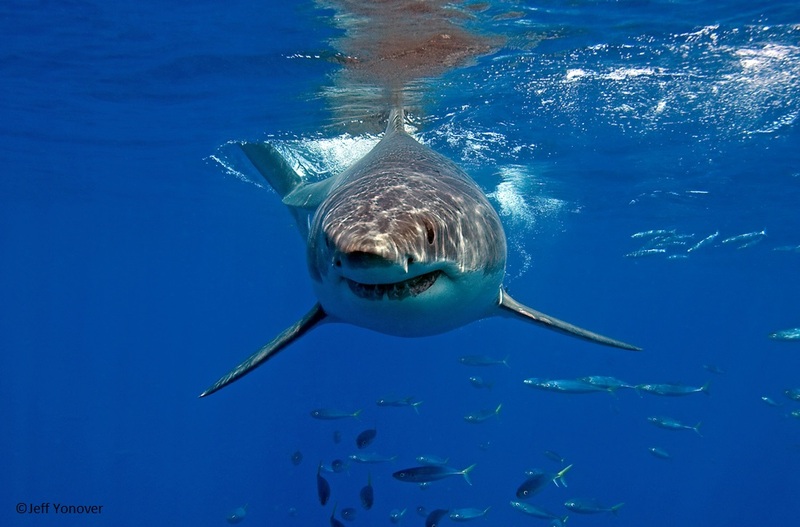 Guadalupe Island in Mexico is the top destination for great white shark encounters. This small volcanic island located 150 miles off the west coast of Mexico’s Baja California peninsula. Operators have counted 108 great white sharks in the bay where they stage their submersible cage diving operations. Socorro Island is a small volcanic island located 375 miles off the country’s western coast. Because of the frequent big animal encounters, this region is often compared to the Galapagos Islands and Cocos Islands. The giant Pacific mantas which you will meet at Socorro are the largest of the rays and often called the most majestic creatures in the ocean. The Mantas in Socorro often interact with divers. Shark and whale sightings are also common. With its Mexican heart and Caribbean soul, Cozumel appeals to divers looking for a quick getaway. Known for easy drift diving, Cozumel wall diving is like watching a coral movie go by. Fall in, get neutral and watch the scenery as the dive boat above you follows your bubbles. 100 foot visibility, warm water makes this a great place for beginners and advanced divers alike.